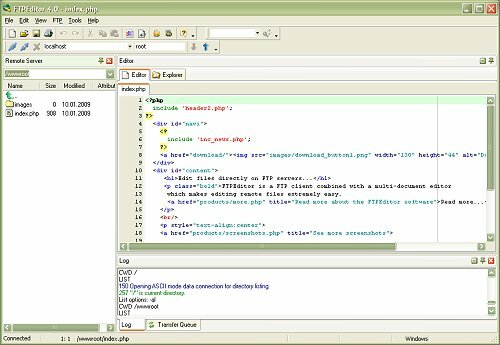 FTPEditor is a FTP client combined with a multi-document editor which makes editing remote files very easy. FTPEditor includes a complete FTP client which supports all common FTP commmands like uploading, downloading, renaming, manageing permissions and more. Connect to your servers using FTP over SSH or SSL. Besides that FTPEditor also supports standard FTP. Use FTPEditor across all over your team to prevent concurrent edits and data loss. "Great product! Very easy to use from the start and makes complicated tasks easy to do." "Hi, your program works great, I love the features and it's so cool to be able to manage my files directly on the ISP server." "I absolutely love your FTPEditor ! I've been searching for something like it for a long time. ... Your program is just what the doctor ordered. ... At any rate, many, many thanks for creating it."